The heavens seem to be smiling down on Pope Francis on the second half of his U.S. trip. 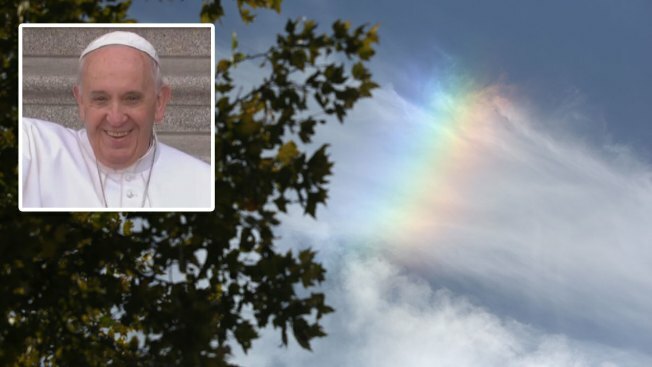 A weather phenomenon that looks an awful lot like a rainbow has now appeared in the skies above New York and Philadelphia when Francis was in town, dropping jaws wherever it appears. They aren't actually rainbows, though. The beams of rainbow-colored light are called a sundog and caused by the sunlight refracting in the ice crystals of cirrus clouds, which were over New York Friday and Philly Saturday. But for those who spotted the sundogs, the "rainbow" shining bright without rain seemed like a message from heaven. "There was no rain yesterday (just sayin)," Tom Mendoza tweeted, along with a picture of the phenomenon. NBC Philadelphia's David Parkinson contributed to this story.